For this Watercooler Wednesday Blog Challenge #206, the theme was "Anything Goes" since the challenge starts during the fifth week of January. 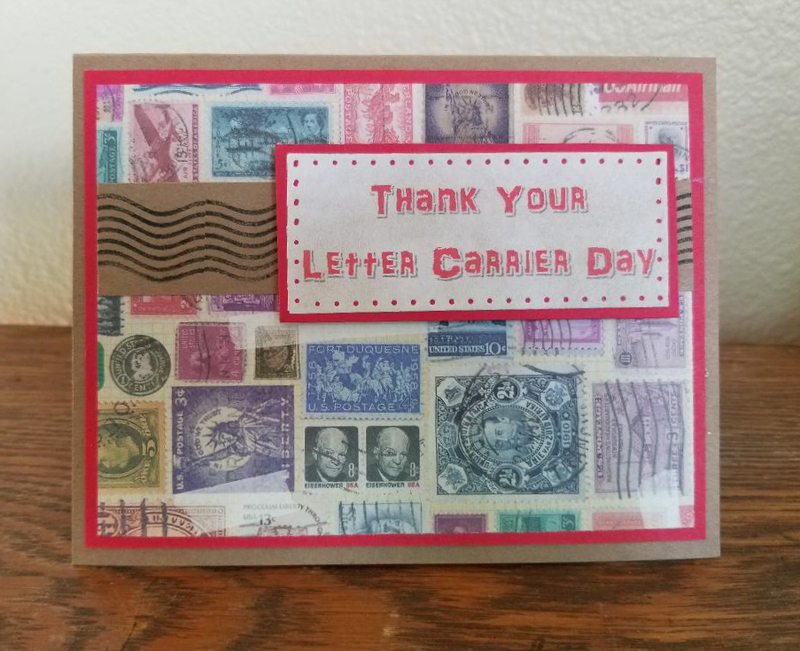 As card crafters, who better to recognize than you friendly mail carrier on his/her special February 4th holiday? Of course, I wanted the card theme to be related to mail in some way. I have a great DCWV 6"x6" paper stack called "Maps, Text, and Ledgers" that had a design paper that was full of cancelled stamps. I used the colors in the paper to guide my selection of card stock. The card base is Stampin' Up! (SU) Kraft, with a Real Red matting. There might be a mail carrier appreciation stamp out there somewhere, but I found it easier to use a special font on my printer and to print it out on SU Whisper White cardstock in red and black. I didn't like how bright the white was, so used a craft sponge to darken the white with SU Crumb Cake ink. I cut out the sentiment using Sizzix "Dotted Rectangles" dies to give the sentiment piece a little bit of "postal" look. The strip of SU Kraft paper behind the matted sentiment element is stamped with the Hampton Arts Stamps "Postal Cancellation" stamp I bought more than 10 years ago. I used my old stamp posiitioner tool from Personal Stamp Exchange that works really great with wood mounted stamps to repeat stamp the cancellation image over and over across the strip of Kraft cardstock, then trimmed it to fit and glued it to the card front using Tombow glue. The matted sentiment was attached over the cancellation strip using adhesive foam strips to raise it up above the level of the card front for added depth and interest. The card was super easy to create since I had the stamp pattern paper to establish the base for my postal theme. I am rating the difficulty level at "1" out of a possible "5". A stamp positioner is DEFINITELY required to create the row of cancellation wiggles. Hi Donna, since our town doesn't supply us with "to the door" mail delivery, I won't be making a card to celebrate mail carriers. But what a clever idea, especially covering the card with that unique stamp pattern paper. The red and crumb cake colours really compliment the stamps beautifully. This card was made for the Try Stampin' on Tuesday June masculine bog hop. 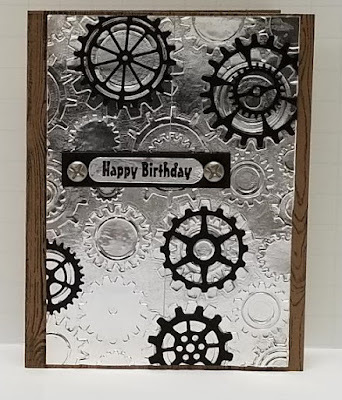 What's more masculine than a card made with metallic gears, cutout gears, and wood??? The card base is Stampin' Up Crumb Cake cardstock stamped with the retired SU "Hardwood" background stamp using SU Early Espresso ink. Warm Wishes - With Mittens! 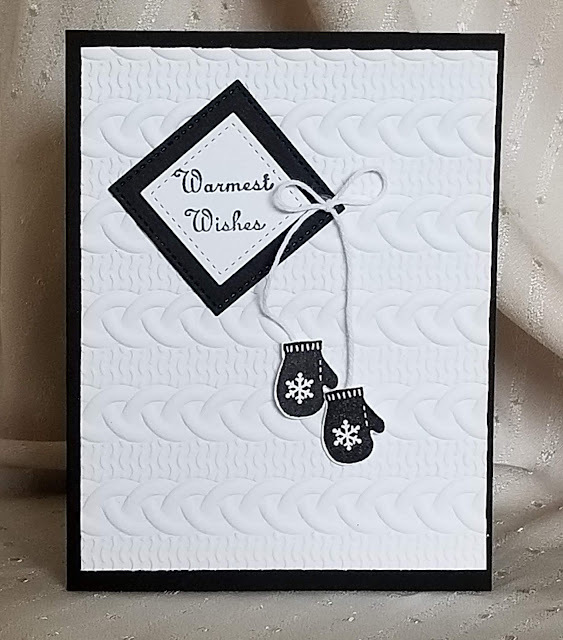 Retro Rubber Challenge Blog #102 that required the use of a stamp older than 1 year - the sentiment is from the 1993 Stampin' Up "Great Greetings, and the mittens are from the 1999 SU "Holiday Sampler" sets. The challenge also required that the card be black & white. Color My Heart Color Dare #326that required the use of black and white with an optional splash of another color. Double Trouble #19 which required the use of their "Warm & Cozy" theme and to also participate in this week's partner "Creative With Stamps". Creative With Stamps #34 which required the use of mittens on the card. To create a card that met all these challenges' requirements, I used a Stampin' Up! (SU) "Cable Knit" dynamic embossing folder (creates extra deep impressions) to emboss the main panel of SU Whisper White cardstock. A Woman's Place is at the Beach! This card was made for Retro Rubber Challenge Blog #92 (#rrcb92) whose theme is "Life's a Beach"). Watercooler Wednesday Challenge #182 with the theme of "feminine anything goes". 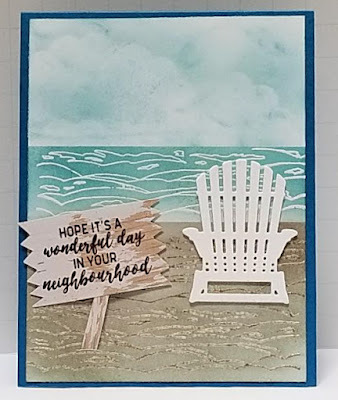 I have a 1991 stamp that is just perfect for making ocean waves,,,, and I've discovered it does a fair job a making sandy beaches, too! This stamp is a wood mounted "waves" pattern made by a company called Purple Waves in Ventura, California. I can't find them online, so they must have gone out of business. But thank goodness I found this great stamp before they did!